It has been awhile since I have been here, I know. It has just become so hard to bear anymore. Not you, Michaela. You would never be hard to bear. The other day, I was taking care of your little nephew, my grandson. He is six months old, and six month old babies can be a lot of work. His mom and dad have been busy lately with the theater program they work for, so I have been babysitting. They asked if it would be okay if they went out on a date one evening, or would that be too long to watch him. And you know, I looked in his face, and I thought, how could I ever say it would be too much, too long, to care for him. He is so innocent and helpless, I looked into his face and said, "No, nothing is too much for you. It is never too much time or too much effort to care for this innocent little baby I love so much. It is my privilege." I feel that way about you, too, Michaela. Wherever you are, whatever you have been through. I could never stop loving you, could never say it's too much. What becomes too much is your missingness. I know that's not a word, but I have just coined it. What becomes too much is my utter helplessness in the face of your missingness. I can't find you. I don't know where to look. I can't make other people do what I think should be done to find you. I cannot help you. Twenty-seven years, six months, 14 days at this point. All that time of all this helplessness in the face of the worst possible thing that could happen to me, that my child is suffering. And I can't help. If you are out there, Michaela, and you can help me, please do. Please remove the missingness, remove the questions and the wondering and let me know where you are, and that you are okay. If you can't come home and don't want me to try, that's okay. If you don't want anyone else in the world to know, I won't tell. Tell me our family code word if you remember it. Tell me something only you and I would know. Tell me that you are alive, that you are okay. Tell me if you have children! Leave an anonymous comment here, or email me at missingmichaela@gmail.com. Your missingness doesn't become easier to bear with time. It becomes harder. It reaches the point where I want to put my head under the bed covers and not come out, where I was to exist in the gray lands where I deny my feelings because they are too painful, where I kill of my imagination, because that is the easiest way to make sure it doesn't wander too far down the painful paths. If I can't help you, Michaela, can you please help me? When my children were little, I always had that thought in the back of my mind anything can happen in the blink of an eye. As children become teens and young adults they think they are invincible and nothing will ever happen to them. 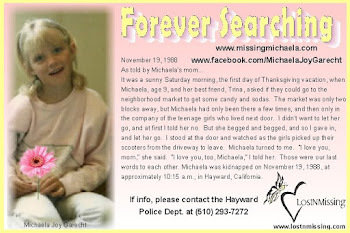 I know Michaela had siblings when she went missing, then you also had other children after she went missing. I feel certain her kidnapping and being gone all these years has affected you, your first marriage, your second marriage and all of your kids. 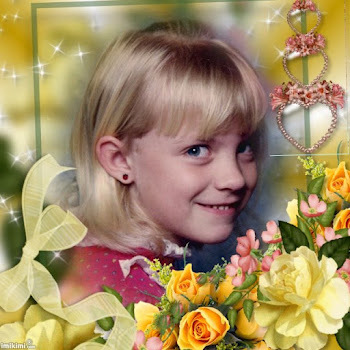 Life for your children, I’m guessing was one way because of having a mother of a missing child and being a sibling of a missing child and life most have completely different for all of you had Michaela NOT been kidnapped. My husband is military. 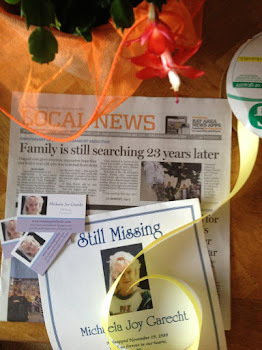 When we were stationed in Germany, over 20 years ago, our neighbor, Gretchen was the mother of a missing child. When Gretchen’s other child, Hazel had a child of her own… I’m not quite sure how to explain it, except to say, if you didn’t know any better you’d think Hazel was the mother of a missing child. Hazel’s behavior as a mother although seemed “normal” or I should I say typical of someone person who’s childhood/life had been affect by her siblings kidnapping. That said her behavior was a little over the top or extreme sometimes. Now that you’re a grandmother and your children have children. I was curious if your kids who are parents…..Are they a little more..Cautious, on guard, overly concerned about child safety? 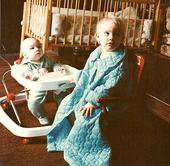 Even with Steven Stayner, I know this is a bit different because he was an actual kidnap victim vs the sibling of one. When he married and had children of his own, he was paranoid about his kids NEVER, EVER being out of his eye sight. He always claimed it wasn't out of fear of HIS kidnapper coming for his own children. He always stated he knew 1st hand what happen to children when they were out of their parents eye sight. It diffidently affected the way he raised his own kids. That is a really, really interesting question, and not one that can be answered in a short comment. In fact, I have been thinking about doing some more extensive writing about this, kind of a "child safety for anxious parents" sort of thing. My kids are all grown up now. Not counting Michaela, they are 22, 28, 30, and 35, and I have a 25-year old stepdaughter who lived with us growing up, and who is now a police officer by the way! I'm very proud of her, but hey, she puts herself in danger every time she goes to work! Both my youngest and my oldest have children of their own. 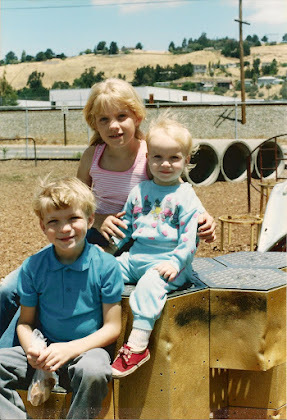 My older kids, Michaela's full siblings, were all born before Michaela was kidnapped, although only my oldest son actually remember her. Alex was 8, Libby was 3 and Robbie 8 months when Michaela was kidnapped. Their childhood was kind of dramatic, for sure, but I think they all turned out to be pretty stable people, not anxious, not fearful. My youngest daughter, who was born five years after Michaela's kidnapping, has not been like that at all. From the day she was born she suffered from separation anxiety. To this day, she has a great fear of loss, of people she loves dying. Now there may be a lot of reasons for this, but I chalk it up at least in part to prenatal emotions, because it was in the process of opening my heart up to this new life that my heart opened up to feeling all the pain I had been burying and denying in the intervening years. So now my baby has a child of her own. He is only six months old, so I don't know how she will be with him as he gets older. But we have talked a bit. I firmly believe in following common sense child safety practices. And she knows what those are, because she lived with them. She not only knows the rules, but the ins and outs of them, which ones helped her, which ones may have harmed her. But the thing is, all my kids grew up. That rule about not playing where I can't see you just failed to apply after awhile, you know? The greatest horror I faced with all my kids was handing them car keys and letting them go out on their own in a car once they had their drivers licenses. But I did. And they drove off, flew the coop, became independent adults, did things without even telling me, much less asking my permission! And I survived. Somewhere along the line, I learned to let go. Oddly, having a missing child perhaps even helped in that process. Once you have survived the worst thing that could happen, it can actually give you just a little more courage, because you learn that you can survive. This is what I have told my daughter. It may sound terrible, but I just confirmed what she knows. Eventually, one near or far day, love always ends in loss, to one or the other of you. That's part of the price you pay for love. But you can't hang onto love around the neck, whether it is a lover, a husband, wife, or child. Sometimes you have to come to the realization that whatever happens, you will survive. I have seen her incorporating this knowledge into herself in other ways. She has become far stronger and more courageous, I think, than if she'd never had fears to face in the first place. It will be interesting to see how this plays out in the future as she raises her son. It is a very complex and subject. You know the Kelly Clarkson song lyrics, "Because of you I never strayed too far from the sidewalk...." Somehow we have to keep our kids safe, yet give them freedom, teach them to be courageous yet still cautious, and somehow stay sane ourselves! Sharon. I am so very sorry for your heart ache. I don't think I could survive that. I have 5 grand babies & DO NOT let them outta my sight when we are out playing, on a bike ride or anywhere. With all this craziness, hatred & horrible people, I am scared of every thing!!!! Thank you for all of your amazing post's. I will repost & ask everyone to read them all. I will now look into every woman's face, around her age. Looking for your beloved Michaela. My heart aches, for the pain you endure. 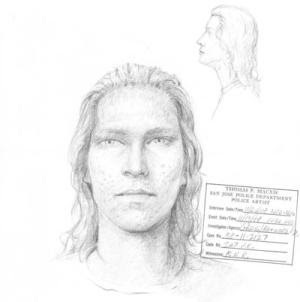 I have known about Michaela since 1989, and this case, along with that of the yet still unsolved case of Amber Hagerman remain the most haunting to me. Yours, because of your public blogs etc., which are tremendously heartbreaking at times. I sometimes "fantasize" of finding your daughter for you, and ending your suffering. To this day, I cannot listen to a Pat Benatar song on the radio because it instantly brings Michaela to mind, because if the picture of her wearing the Benatar t- shirt. I often times wonder, how someone can even survive such a thing as what you've been through (and continue to go through). And I'm unsure whether expressing any of this to you is in anyway helpful, or just adds to your suffering. I wanna hold you, and bring your daughter back to you. I know that that's impossible, but I desire it nonetheless. I know that this may be wrong, but I have even fantasized about hurting the people who perpetrated this monstrous evil on you and Michaela. I'm sorry this happened to you dear Sharon. I wish only that words could heal. Sharon, Michaela, you and your family have been on my mind non-stop over the past few days with the discovery of Jacob Wetterling in Minnesota. I cried for him and everything he endured...the unfathomable terror and confusion that made him ask "what did I do wrong". I gained some inspiration from his Mother that despite enduring 27 years of emotional carnage...she emanated light like an Angel and proved that a vile action does not always endure forever. So many learnings and changes came out of the kidnapping of that little boy...it was his gift. 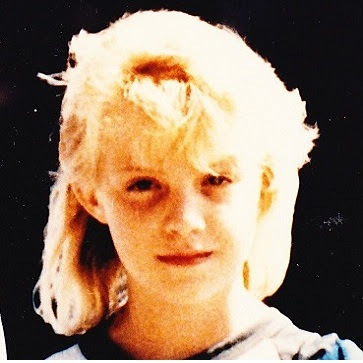 My tears then turned to your little girl in my own backyard in the Bay Area with blond hair and a deep smile and wonder when will she find her way home. I know you cannot share anything about the investigation...but in your heart of hearts is there a likelihood that someday you and our entire community can find closure. On one post you said someone knows or knew something but chose not to come forward. I'm not sure how that person can live with him / herself. We have not forgotten Sharon. 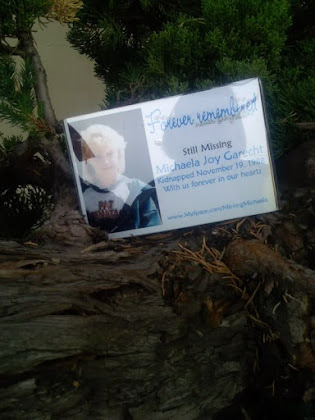 Although the pain you carry for her absence is unique, the community around you bears it also in our own fashion... Please do not give up hope. I know you struggle with faith sometimes but God is all merciful and although he does not interfere with free will,He does love us, wants to see us happy, and in the time He deems appropriate makes that happen. I don't feel a lot of faith in the prospect of getting answers. It doesn't feel as though anything is being done by anybody except a few volunteers. I think it will take a miracle. I agree about Patty Weterling. I love her. I feel what she said about how it hurt to learn what Jacob endured. I wonder if I am strong enough for that myself.